Marinate chicken thighs in five spice powder and salt for at least 30 minutes. Mean while, put oil in a pan and fry curry leaves until fragrant/ golden. Set aside. Heat some olive oil and sauté garlic until fragrant and add broccoli florets in. Put a dash of tamari to season and add drained, soaked goji berries in. Fry marinated chicken thighs in a pan, 10 minutes on each side until juices turn clear (not pink). 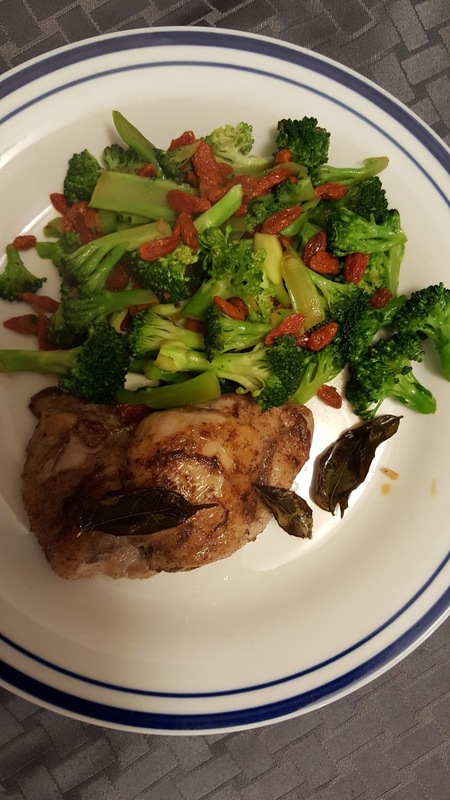 Serve with broccoli and goji. Sprinkle prepared curry leaves on top. Serves 4.